Most noteworthy is the filing by Firewheel Energy that their H&H Ranch #41H well had an initial production rate of 1,250 barrels of oil and 1,484 mcf of gas in a 24 hour test period. This equals almost 1,500 boed! The location of this well in relation to Lynden Energy's Mitchell Ranch can be seen on the map from the December 6 posting. This news is very relevant to the potential of Lynden's Mitchell Ranch. Also, there was a good mention about the Cline Shale on the newswest9.com website (click here for a link to the article). The article mentions "The energy industry's buzz over the Cline shale is getting louder. The formation has the potential to make a huge impact on the Permian Basin." 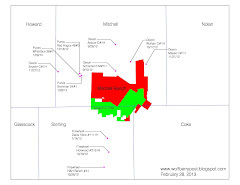 Midland Energy Expert Morris Burns says, "This is a huge shale formation." Geologist Gary Dawson who has studied the Cline for years says, "It's kind of the perfect shale...Right now we're just barely tapping the potential of the Cline Shale." One other item to note, when searching under JVL and Lynden, it was noticed that JVL Advisors acquired shares in Epsilon Energy Ltd. (click here for the article). Epsilon is referred to as "Lynden" in the news release. Not sure if there's any relevance or whether it's just a typo.